From the outside, Single Thread looks more like an embassy than a restaurant. The cream-colored, two-story Italianate building occupies a corner lot in downtown Healdsburg. It's imposing and elegant. While it was once the site of a government building, the profusion of potted plants, black awnings and subtle signage reveals that it's now a house of luxury. Open the heavy wooden door, step inside the dimly lit foyer, and you enter a carefully calibrated decompression chamber. Serenity pervades the hushed, small space. The attendants behind the reception desk don't ask for the name of your party or consult a reservation list, but rather greet you by name as if they already know you. They do. The black and brown hues and earthy calm of the room stand in contrast to the brightly lit kitchen framed by an opening in the wall opposite the front door. Inside the proscenium, chefs in white coats, gray aprons and neat beards move with quiet focus, barely seeming to notice the guests peering in. Unseen to diners in the kitchen is a wall of nine video monitors that track guests as they flow through different zones of the restaurant—the parking lot, the approach to the front door, the lobby, the hallway of the five-room inn upstairs, the dining room. The video system allows staff to know when someone is about to enter the restaurant. Kind of creepy, but such is Single Thread's attention to detail in the name of service and hospitality. Before stepping into the dining room, guests are whisked up an elevator to the roof garden for an aperitif, an appetizer and a leisurely view of the western sky above Healdsburg before heading back down the elevator. Pushing through the dining room door reveals the inner sanctum. It feels like a living room with appealing rooms and corners. Eames-like chairs were custom-made with seat backs at just the right angle to promote comfortable sitting while eating. Soft overhead lighting, potted plants, floral displays and handmade Japanese pottery arranged around the room like family heirlooms add to the elegant, but inviting effect. It's good to get comfortable. Meals last three to five hours. The kitchen is fully open to the dining room. It's a gleaming room of stainless steel manned by chefs who move around workstations with the deliberate precision of lab techs, hunching over plates or searing meats on an open hearth in a quiet culinary ballet for all to see. kaiseki-style tasting menu is $294 per person. The wine pairing goes for $200. For the price, the caliber of the food and professionalism of the staff, the Sonoma County–influenced Japanese restaurant is in a category of one. Shortly after it opened in December, the James Beard Foundation named Single Thread a semi-finalist for best new restaurant in America. The 2017 Michelin guide won't be out until the fall, and top new restaurants generally don't get more than one star, but there are exceptions, and I would not be surprised to see Single Thread collect two on its first time out. 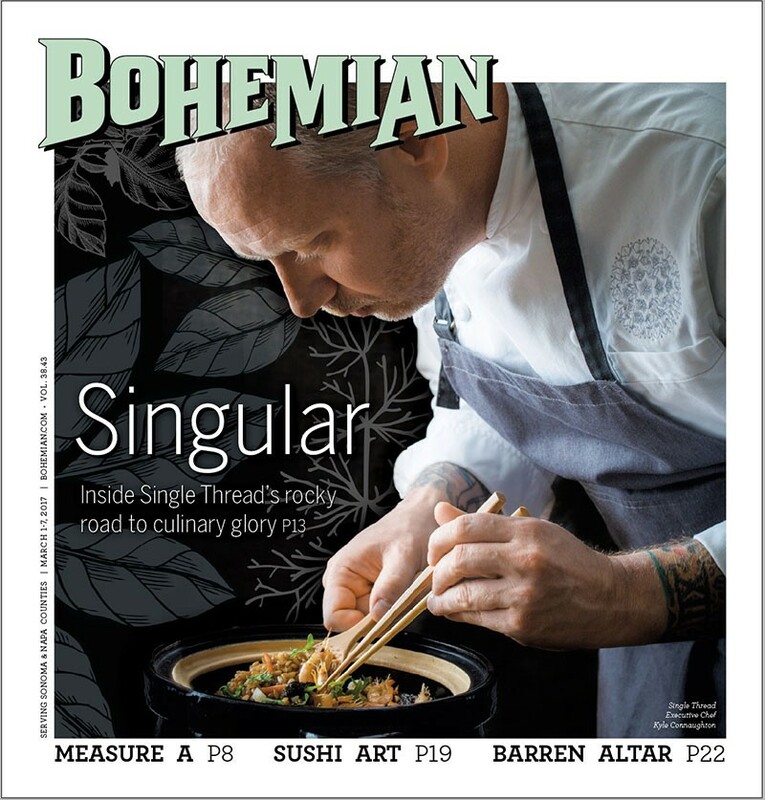 Over in Napa County, the French Laundry and Meadowood both have three stars, and Single Thread is clearly looking for entry into that exclusive club. Single Thread is the creation of chef Kyle Connaughton and his wife, Katina. High school sweethearts, the couple's career in food and farming has taken them all over the world—Japan, England, Seattle and Los Angeles. Single Thread is the first restaurant of their own. "The vision was always to have a very small restaurant, just a few [hotel] rooms, something manageable, and for Katina to be able to farm," says Kyle, whose soft-spoken, cerebral manner calls to mind an academic, albeit one with an arm of vivid tattoos. "It matches almost 100 percent of what we saw in our mind's eye of how the pieces all work together. It was worth the time and the wait." The road has been a long one. The Connaughtons moved to Healdsburg in 2012 with two daughters, a dream and little else. "There's this notion that we arrived here one day and said, 'We're opening a restaurant,'" Kyle says, referencing some of their critics. "We moved out here without jobs or anything. There was no investor saying, 'come out and we'll back this.' It was 100 percent start-from-scratch." The couple had been visiting Napa and Sonoma counties for years and, in spite of their Southern California roots, were drawn to the North Bay. "It spoke to us much more than Los Angeles," Kyle says. "This is where we want to be." While developing the plan for the restaurant and raising cash, Kyle worked as an editor for Modernist Cuisine, the publishing company and R&D firm founded by Microsoft CTO turned avant-garde chef Nathan Myhrvold, as well as doing private cooking events and teaching at the Culinary Institute of America. Katina, who honed her horticultural skills during their travels, helped create the landscaping for the Barlow in Sebastopol and worked as greenhouse supervisor for Santa Rosa Junior College's agriculture program.